Richard Rashke is the author of nonfiction books including the bestselling "The Killing of Karen Silkwood" and "Escape from Sobibor." The current refugee crisis mirrors the divisive political debate over welcoming World War II refugees under Presidents Franklin D. Roosevelt and Harry S. Truman. This series of articles views today’s crisis in the historical perspective of World War II and its aftermath. 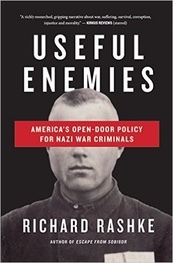 The series is adapted from the author’s book, Useful Enemies: America’s Open-door Policy for Nazi War Criminals. The United States entered the war after the bombing of Pearl Harbor in December 1941 with its “no refugees—especially Jews” policy intact. Two secret plans in 1943 illustrate Washington’s continuing xenophobia, anti-Semitism, and fear of political backlash if it softened its stance on Jews. Early in l943, neutral Sweden had come up with a realistic plan to save 20,000 Jewish children. At the time, it had good relations with Germany and felt confident that if it asked Hitler to release the children, he would agree in order to ensure a steady supply of Swedish steel needed to keep German tanks rolling. Already bursting with 42,000 Jewish refugees, including almost all of neighboring Denmark’s Jews, tiny Sweden turned to England and America for help. It would welcome the 20,000 Jewish children, if England and the United States would share food and medical expenses during the rest of the war, and agree to resettle the children after the war. If the U.S. agreed to the Swedish plan, it would be expected to take in its fair share of the Jewish children. Washington took five months to respond even though it knew, without a doubt, that Hitler was gassing Jews in death camps in Poland; that millions had already been murdered, including 2.8 million Polish Jews; and that Hitler didn’t plan to stop the killing until he made Europe Judenrein. Polish government-in-exile emissary Jan Karski, a Catholic, had made those facts clear to President Roosevelt during a visit to the Oval Office the previous year, l942. Karksi described his meeting with Roosevelt in detail in his bestselling memoir, The Story of a State Secret. After stalling Sweden for five months, the State Department made a face-saving counterproposal: The United States would accept the Swedish plan only if it would include among the 20,000 Jewish children some Norwegian, non-Jewish orphans. The United States government, in fact, was worried about an anti-Semitic American outcry—our soldiers are dying just to save Jews. By the time the amended U.S. plan finally reached Sweden—eight months after the original proposal—Sweden’s relationship with Germany had become strained. Convinced that Hitler would never release the children, Sweden scuttled the plan. No one knows how many of the 20,000 children Sweden had hoped to save were among the more than one million Jewish children murdered in the Holocaust. Around the same time that Sweden proposed its save-the-children plan, the British Foreign Office suggested a British-American conference in Bermuda to discuss both the current Jewish problem and the looming non-Jewish refugee nightmare. Once again, the United States stalled. Finally agreeing to cosponsor the conference, it tried to take credit for the idea, angering the British Foreign Office, which, like America, was in dire need of good press. The tentative U.S. plan was born out of cynicism and driven by the desperation of the Jewish community, which was pressuring Washington to do “something” before it was too late. Through intermediaries, the U.S. would ask Hitler to release 100,000 Jews trapped in German-occupied territory. In reality, the request was as phony as crocodile tears and would be a win-win-win for the United States. Washington would appear to be sincerely concerned about the safety of European Jews; it would be a hero if Hitler said yes; and Hitler’s “moral position would be further aggravated” when he said no, according to an April 13, l943, Justice Department memorandum. Like the Evian Conference of l938, the Bermuda Conference of l943 was another cruel charade. The cruelty lay in the fact that both Washington and London planned to do nothing to rescue Jews, while publically raising the hopes of the worldwide Jewish community that they would. Simply put, the free world had missed the opportunity to help Jews at the Evian Conference. It was now too late to help them at the Bermuda Conference. With time running out, Roosevelt had no choice but to turn to the private sector for a Conference chief delegate. He eventually recruited Harold Dodds, President of Princeton University and a conservative Republican “restrictionist” on refugees. Accompanying Dobbs as U.S. representatives would be Illinois Senator Scott W. Lucas and New York Congressman Sol Bloom. To round off the Bermuda team, Washington appointed Robert Borden Reams, a seasoned African American diplomat, to serve as Bermuda Conference Secretary. The token black on the Washington team, Reams was a strong opponent of accepting war refugees into the country. As Conference secretary, his job would be to limit the scope of discussion and debate; and to make sure, according Robert Rosen in his highly documented book Saving the Jews, that any proposed resolution passed two litmus tests: Would the proposed resolution interfere with the war effort? And was it capable of accomplishment under wartime conditions? Do not offer to accept any more Jews into the United States. Do not pledge funds for any rescue operations. Do not offer naval escorts for ships carrying any kind of refugees. Do not offer any refugees space on empty U.S. ships. Given such restrictive orders, the Bermuda Conference was doomed to shame. It was structured by diplomats in the U.S. Department of Justice and the British Foreign Office who, to put it kindly, had little if any desire to help Jews. Like Evian before it, Bermuda was just another “sop to the…wailing Jews,” according to Rosen. No one in London and Washington dared to say publicly what many of them believed privately—the more Jews Hitler killed, the fewer Jewish refugees America and England would have to harbor after the war. When the conference was over, the United States and England jointly announced that the delegates had passed a number of concrete recommendations to help refugees of all nationalities, but the recommendations needed to remain secret because of the war. One of the top-secret recommendations was to revive the totally ineffective Evian Conference’s Intergovernmental Committee on Refugees so that it could study the looming postwar refugee problem in depth. The other recommendation was to ship 21,000 Jews already safe in Spain to North Africa to make room for more refugees in Spain. Historians tend to dismiss the Bermuda Conference as unimportant because nothing concrete emerged from it. What they fail to see or consider relevant, however, is that something spiritual and illusive happened as a result of the island conference. After deliberately and falsely raising the hopes of the worldwide Jewish community, Bermuda dashed them. Driven even deeper into despair, the Jewish community was reduced to sitting helplessly on the sidelines while the Nazi killing machine continued to murder what was left of European Jewry. Samuel Zygelbojm, a Jewish member of the Polish government in exile in London, became the symbol of Jewish despair. On May 12, l943, two weeks after the Bermuda Conference ended, he turned on the gas in his kitchen oven, stuck his head inside, and breathed deeply. Meanwhile, the systematic roundup and killing of European Jews continued unabated for three months after the Bermuda Conference. The SS was so proficient that, by the summer of l943, there were so few Jews left that the SS no longer needed to staff and maintain its three death camps in Eastern Poland—Belzec, Sobibor, and Treblinka. Berlin decided to phase them out for economic reasons. Belzec was the first. SS officers and guards stationed at the death camp herded the last of its Jews into boxcars and took them to Sobibor for execution. Worried that the 600 Sobibor worker-Jews would fight back, the SS locked them in their barracks. Then they opened the boxcars one at a time and shot the last of the Belzec Jews. A few weeks later, on August 2, 1943, the Jews of Treblinka revolted. They burned down several buildings, then fled into the woods. German soldiers rounded up and executed most of the 200 escapees. The Nazis eventually razed the camp. Two months after the Treblinka revolt, the Jews of Sobibor rose up on October 14, l943. They killed eleven SS officers and several guards. Three hundred escaped into the woods; the remaining 300 were either killed during the revolt or shot the next day. The Nazis razed the camp. That left Auschwitz with the task of killing the Jews still alive. The Allies had long since rejected a plea from the Jewish community to bomb the railroad lines feeding the camp. They argued it was not feasible. In the end, the Bermuda Conference left nothing for the Jewish community to do but pray for a speedy end to the war. Then, the Statue of Liberty would surely smile and open her arms wide to welcome the Jews who had managed to survive the Holocaust. But the Jewish community was in for another shock. Five years after the Bermuda Conference, the U.S. Congress would legislate the xenophobia and prejudices of America into The Displaced Persons Act of 1948.